Main Street Adamsfield, 1926, with Ida Smithies and Florence Perrin. Fred Smithies photo courtesy of the Tasmanian Archive and Heritage Office. In November 1926 a Mrs Gresson advertised tourist accommodation at the Tasmanian mining settlement of Adamsfield: ‘See Tasmania’s Wild West, the “osie” diggers, Adams Falls, Gordon Gorge’. What extraordinary enterprise for a simple digger’s wife 120 km west of Hobart! However, when you learn what an extraordinary woman Lily Gresson actually was, this visionary behaviour comes as no surprise at all. 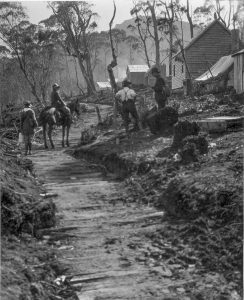 A water race and the village of Adamsfield, 1926, Fred Smithies photo courtesy of the Tasmanian Archive and Heritage Office. ‘the scenery to the Gordon River was indescribable. Peak after peak of snow-capped mountains and the Gordon Gorge was so precipitous we would scarcely see the bottom … [it] … was like so many battlements’. Her party ‘cheerfully stalked along the ten miles of wonderful scenery singing bits of popular songs. This was the first time I had heard [‘]Waltzing Matilda[’], she recalled, ‘and it certainly cheered and helped us along, and home again, when we’—Lily and her husband Arthur Gresson, a veteran of the Siege of Mafeking during the South African War— ‘were beginning to flag’. Certainly the outing would have come as welcome relief from the routine of life on the Adamsfield diggings. The Gressons had rushed to Adams River in the spring of 1925, after the Staceys from the Tasman Peninsula and their mates struck payable osmiridium. Lily was a woman of great conviction. At a time when few women dared venture among the thousand or so men on the ossie field, she secured her own miner’s right, put together a side of bacon and other requisites, bundled her twelve-year-old son Wrixon onto the train and off they went to Fitzgerald, the western terminus of the Derwent Valley Line, to join Arthur. 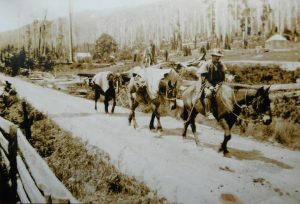 A packer leading a pack-horse team out of Fitzgerald, taking supplies into Adamsfield, 1925. Alf Clark photo courtesy of Don Clark. This was pack horses returning unsupervised from Adamsfield. 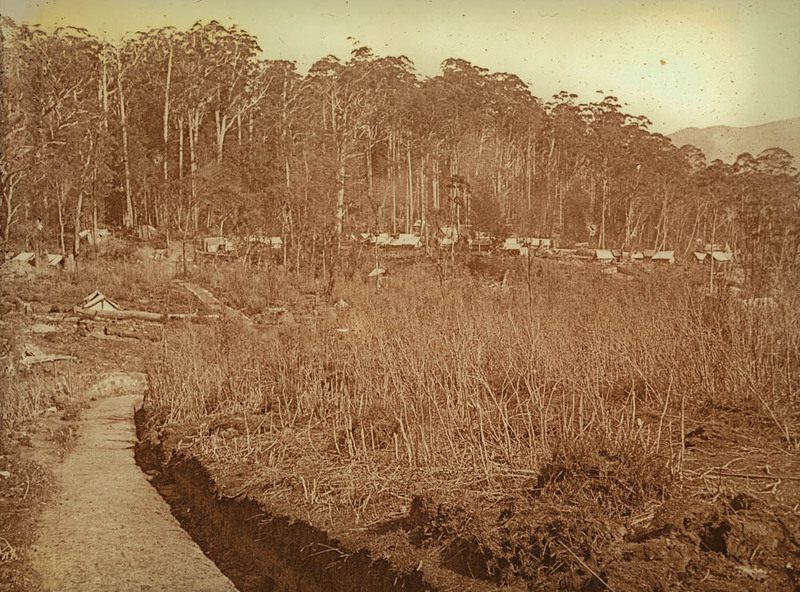 When the osmiridium field was reached, the horses were simply released to find their own way back down the track to Fitzgerald. Given that there was no feed between the two centres, the hungry animals galloped wherever they could, a nasty surprise for the uninitiated coming the other way. How the horses survived the return trip without a broken leg is hard to imagine. The Gresson party stopped for the night at Chrisp’s Hut, a leftover from the 1907 Great Western Railway Survey. It took a further day to reach Adamsfield over the ranges. 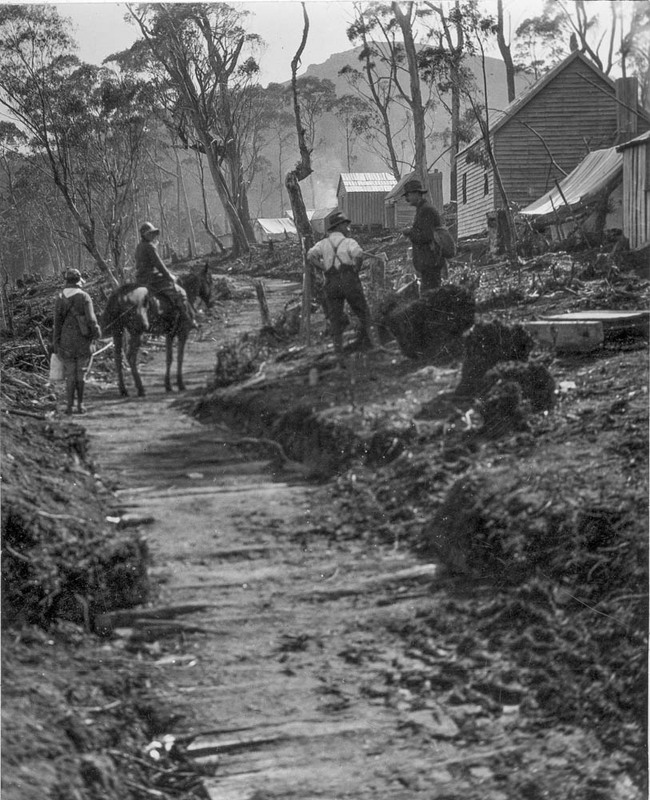 The mining settlement was ‘a busy seething mass of men and horses, to say nothing of a vast morass of mud, with short stumps sticking up everywhere, quite enough to topple us over’. Arthur Gresson was living in the sort of tent-hut typical of a temporary miner’s quarters. Wrixon slept on a bench in a bark humpy with only a hessian curtain to keep out the cold, while his parents bunked down under a tent fly. Having obtained the miner’s right, Lily was entitled to peg her own claim measuring 50 yards by 50 years (that is, about 45 metres square), and she set out next morning suitably attired in her lace-up mining boots, riding breeches, short coat and emerald-green rain hat. After she had dug a hole almost two metres deep and obtaining osmiridium-bearing earth, a man ‘jumped’ her claim, taking all the valuable ‘wash’ before she even knew it had happened. Arthur Gresson sent the intruder packing, but the damage was done, and Lily had to start again on a new claim. Soon she was winning tiny nuggets of coarse ‘metal’ by sluicing the ‘wash-dirt’. The Gressons remained at Adamsfield through the tough winter of 1926, when the diggers tried to counteract a reduced osmiridium price by selling their metal directly to London. It was tough going through that winter. Many left the field, while others stayed and suffered. Lily recalled the time nineteen-year-old digger Maxwell Godfrey went missing on an icy-cold night. He curled up under a log in the bush, but his legs were frostbitten. Nurse Elsie Bessell, who had only a tent for a hospital, could do little for him, and the news got no better after he was stretchered out to Fitzgerald, slung between two horses. Both his legs were amputated below the knee. A public subscription raised about £500 to help him, and soon he was walking again with the aid of prosthetics. 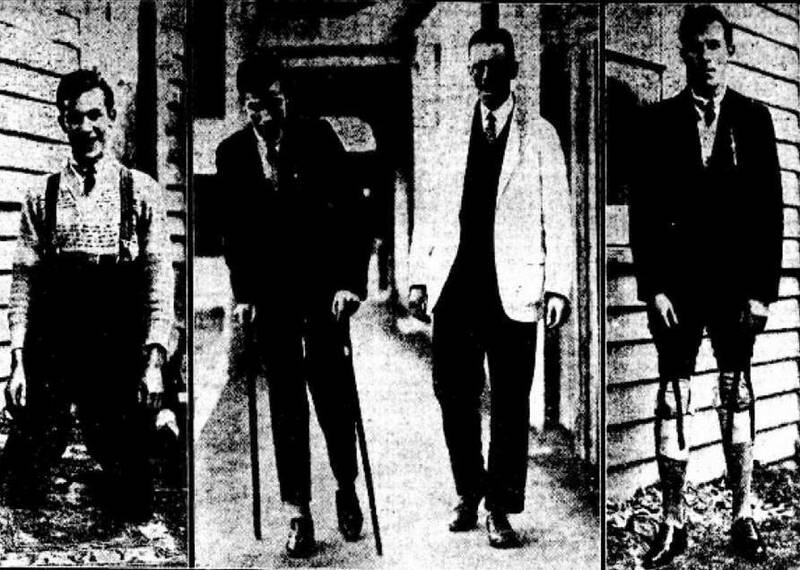 Maxwell Godfrey walks again, from the Mercury, 24 May 1928, p.5. Lily Gresson, who had had some nursing experience in London, again showed her versatility by looking after the two patients in the hospital while Nurse Bessell accompanied the incapacitated man out to the railway station. Perhaps Lily also home schooled thirteen-year-old Wrixon. There were few children and no school at Adamsfield at this time, so otherwise he would have lost a year of his education. And the Gressons’ Air B’n’B house? Well, while it was hardly the Adamsfield Hilton, it was comfortable enough by mining frontier standards—a paling hut with a big fireplace and a real glass window. Lily Gresson might have been just a little ahead of her time. Hikers would soon be on their way to Adamsfield and the glorious south-west beyond. Ernie Bond would be besieged with them at times on his Gordon River farm, Gordon Vale, during the 1930s and 1940s. In 1952 the Launceston and Hobart Walking Clubs would even inherit Gordon Vale. Lily Gresson , pioneer of the Adamsfield diggings, was onto something! With thanks to Dale Matheson, who showed me this story. ‘Board and residence’, Mercury, 23 November 1926, p.1. Lily Gresson; quoted by Fred A Murfet, in Sherwood reflections, the author, 1987, p.194. Lily Gresson; quoted by Fred A Murfet, in Sherwood reflections, p.190. In her account, Lily Gresson did not mention the notorious ‘Digger’s Delight’, the sly-grog shop and accommodation house that accompanied Chrisp’s Hut soon after the Adams River rush began. Perhaps Ralph Langdon and Bernie Symmons had already moved on into down-town Adamsfield, building Symmons Hall with its accompanying illegal boozer. Lily Gresson; quoted by Fred A Murfet, in Sherwood reflections, p.192. ‘Bush nursing’, Mercury, 22 July 1926, p.11; Elsie G Bessell, quoted by Marita Bardenhagen, Adamsfield bush nursing paper, presented at the Australian Mining History Association conference at Queenstown, 2008; ‘Sufferer in bush’, Mercury, 24 May 1928, p.5. ‘Maxwell Godfrey Fund’, Mercury, 27 July 1927, p.3; ‘Maxwell Godfrey walks again’, and ‘Sufferer in bush’; both Mercury, 24 May 1928, p.5. 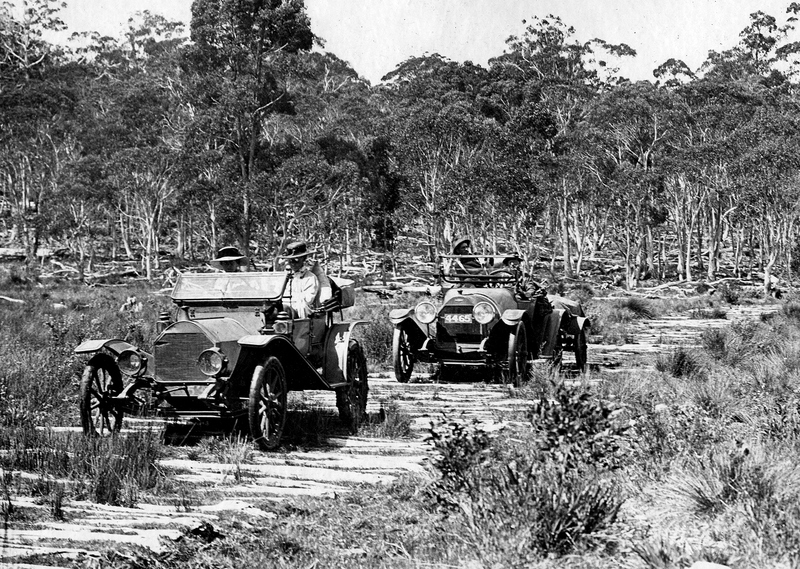 Starting out from the Ouse River in the Hupmobile, 1914-15 trip. Ray McClinton photo from the Weekly Courier, 28 January 1915, p.18. It was the first motor trip to Lake St Clair. 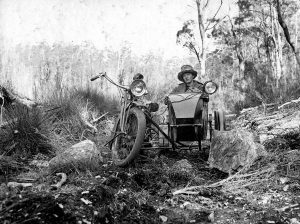 In 1915 pioneering motor tourers Ray and Edith McClinton mounted a two-week expedition from Launceston to the highland lake, with ‘Nina’, social pages and women’s editor of the Weekly Courier newspaper, as their guest. The Hupmobile party, towing an additional 120 kg of motor boat engine and luggage, battled rocks, ruts, rain and button grass up the Derwent Valley, breaking their trip at Ouse, the Ellises’ house near the Dee River, Weeding’s at Marlborough and Pearce’s at the Clarence River. McClinton, a San Francisco dentist who with his wife lived in Launceston 1904–28, would soon become one of Tasmania’s great tourism ‘boosters’. Like fellow Launceston rev-heads Stephen Spurling III, Fred Smithies and HJ King, McClinton worshipped both nature and technology. He wanted to crash deep into the highlands, breaking down the physical and virtual isolation with carburettors and cameras. He was also imbued with fervour for worthy objects and the nineteenth-century tradition of public education that made him a consummate lantern slide lecturer on anything from x-raying teeth to colour photography. Soon he would turn those skills to promoting Tasmania’s scenic wonders. 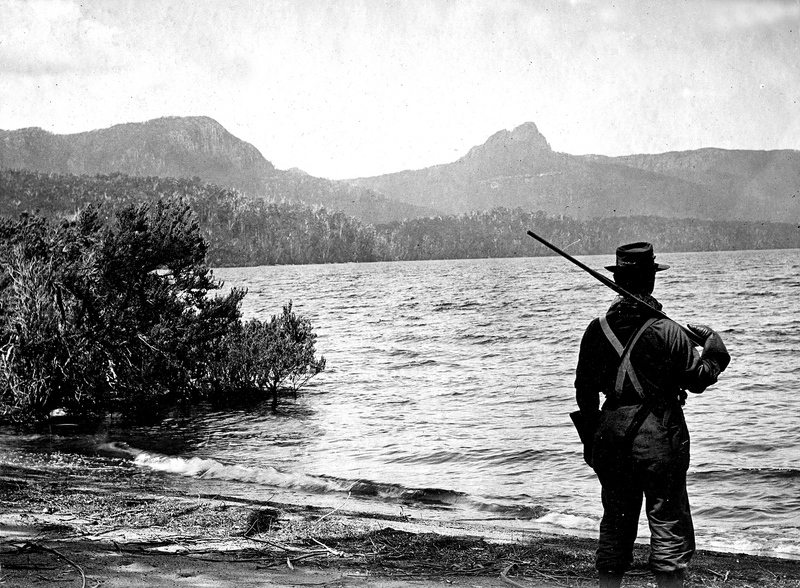 Visiting Lake St Clair was one of the foundation stones of his eventual campaign in support of plans for a Cradle Mountain-Lake St Clair national park. The Hup party at the government log cabin, Cynthia Bay, Lake St Clair, 1914-15 trip, with the unmistakable figure of Paddy Hartnett closest to the camera. Ray McClinton photo from the Weekly Courier, 28 January 1915, p.18. 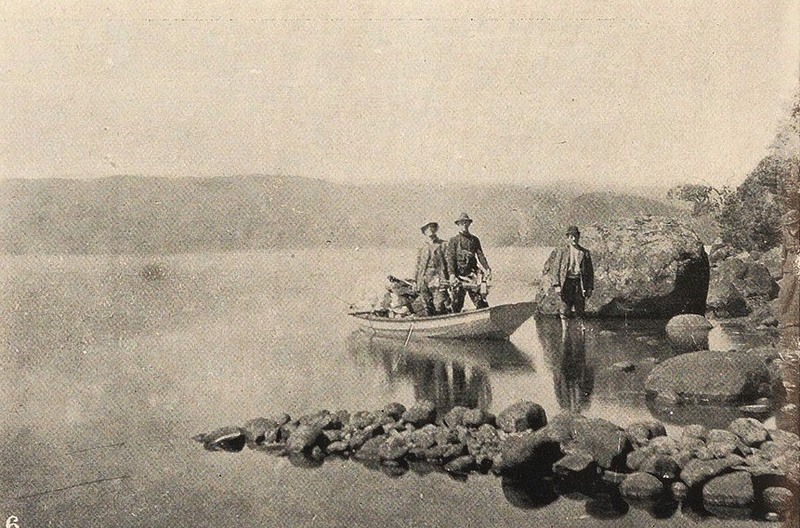 The motorboat and Paddy Hartnett in the lake, 1914-15 trip. Ray McClinton photo from the Weekly Courier, 28 January 1915, p.18. ‘The beauty of the scene is inexpressible. One can imagine the crowds of tourists who would visit Lake St Clair if the road were made. A number of small chalets built, with a caretaker in charge, and a motor boat available for the use of visitors, would help matters along considerably. I hope it will not be long before such dreams come true’. 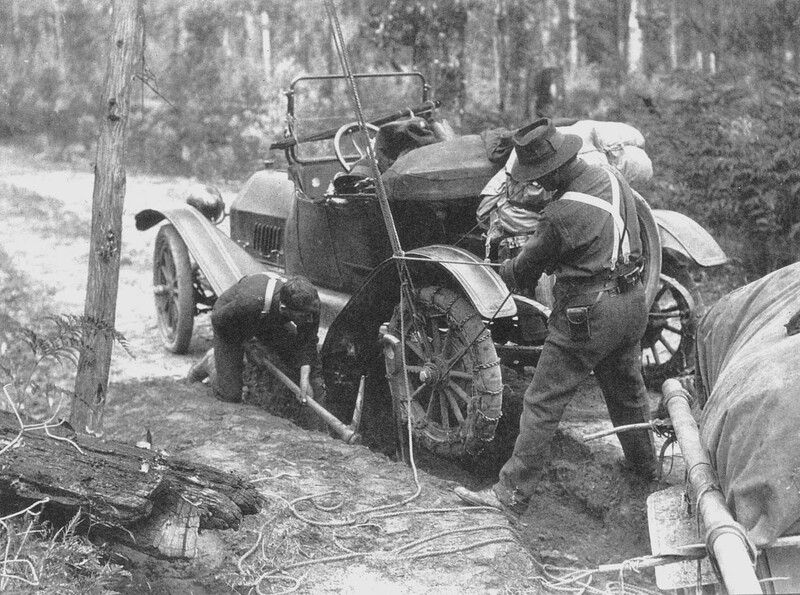 Stuck in a wash-out near Ellendale, 1916-17 trip, King and McClinton in action. HJ King photo courtesy of Daisy Glennie. The Hupmobile, containing the two ladies, and McClinton in the ‘Baby Grand’ Chevrolet, posed as if tackling the corded track, 1916-17 trip. HJ King photo courtesy of Maggie Humphrey. ‘The darkroom at Lake St Clair’, HJ King despairs over the photographic facilities, 1916-17 trip. HJ King photo courtesy of Maggie Humphrey. The 1916-17 party at Bushy Park, Sir Philip Fysh with the white beard, the McClintons at centre, with Kate Farrell fourth from left. 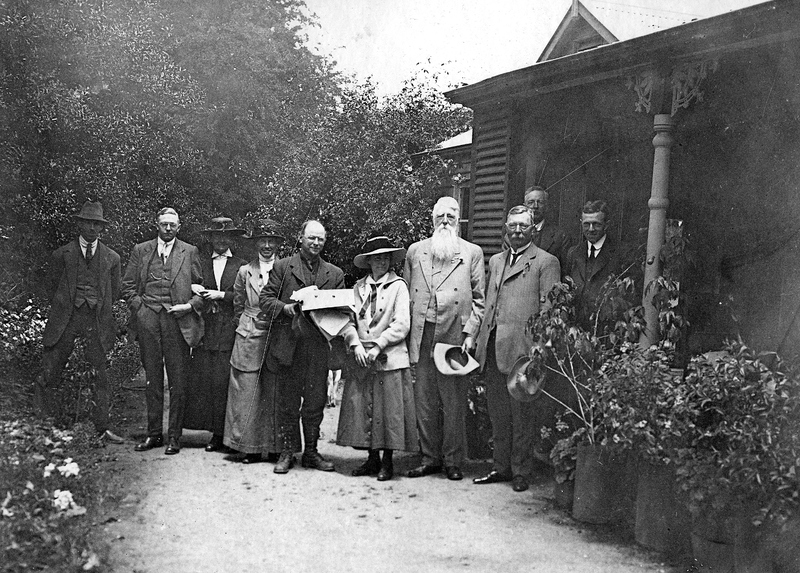 Bushwalker and park administrator WJ Savigny is second from left. HJ King photo courtesy of Maggie Humphrey. The McClintons and Farrell repeated their Lake St Clair excursion two years later, this time with the established amateur photographer HJ King. While King drove McClinton’s faithful old Hupmobile (registration number 586), the dentist was at the helm of his new ‘Baby Grand’ Chevrolet (number 4465). Both vehicles survived—but, in the true tradition of motor touring, it was a near thing for much of the way. The government accommodation house had been destroyed by fire in the intervening two years. However, rather than repeat herself, Farrell minimised her tourism boosting and concentrated on describing the route taken and the social pleasantries of a visit to former premier Sir Philip Fysh’s Bushy Park estate. The real reporter was King. 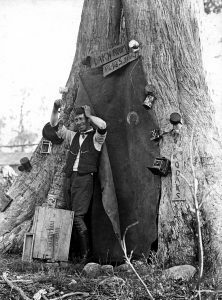 McClinton deferred to the superior shutterbug, allowing him to be the official tour photographer, and many King photos from this trip appeared in the Weekly Courier during 1917, including his light-hearted ‘Lake St Clair Darkroom’. King’s keen eye captured the logistical difficulties of the corrugated track, with block and tackle deployed near Ellendale, some pick and shovel work on the Sandhill at Lawrenny and rescue by a bullock team near Derwent Bridge. McClinton also appears to have had a long stint with a hand saw clearing a fallen tree. One of the most interesting images from the trip was McClinton, the ex-patriate American, recalling his military training by posing with a gun upon his shoulder, as if guarding the beauty of Lake St Clair. How far they were from the European War (King was a conscientious objector, McClinton effectively neutral), yet the connection remained even here. Ray McClinton posed militarily in front of Mount Ida, 1916-17. HJ King photo courtesy of Maggie Humphrey. ‘To Lake St Clair with car and camera’ became one of first outings of the McClinton–King lantern lecturing team. 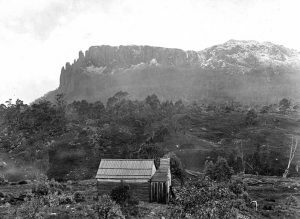 Later, with Fred Smithies, they would add Cradle Mountain and the Pelion region to their lecturing repertoire. At her retirement in 1927 Kate Farrell was ‘Launceston’s senior press woman’ and the last of the Weekly Courier’s original staff. The McClintons were there to farewell her, just ahead of their departure from Tasmania. Farrell died in 1933, after a long battle with illness, leaving only King to enjoy the road they had craved, the ‘missing link’—forerunner of the Lyell Highway—between Marlborough and Queenstown. By then Lake St Clair was well on its way to becoming a tourism hub. See ‘Nina’ (Kate Farrell), ‘A trip to Lake St Clair’, Weekly Courier, 21 January 1915, p.29; 28 January 1915, pp.27–28; 4 February 1915, pp.28 and 29; and 11 February 1915, p.28. Edith McClinton actually left Tasmania for Honolulu in June 1927 (‘Social notes’, Daily Telegraph, 22 June 1927, p.2), Ray MClinton joining her there in November 1928 (‘Dr Ray McClinton’, Mercury, 8 November 1928, p.11). See, for example, ‘X-rays and the teeth’, Examiner, 18 June 1925, p.5. ; and ‘Local and general’, Daily Telegraph, 5 July 1923, p.4. For Launceston rev-head photographers generally, see Nic Haygarth, The wild ride: revolutions that shaped Tasmanian black and white wilderness photography, National Trust of Australia (Tasmania), Launceston, 2008. 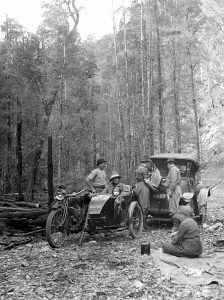 McClinton and Smithies had visited the Du Can Range area in 1913, and may have visited Lake St Clair at that time, but that was a pedestrian trip. See ‘The adventures of Paddy’s Gang: an account of a Perrin family trip to Lake St Clair guided by Hartnett over the Christmas–New Year period in 1914–1915’, diary in possession of Bessie Flood. ‘Nina’ (Kate Farrell), ‘A trip to Lake St Clair’, Weekly Courier, 28 January 1915, p.28. ‘Miss K Farrell’s death’, Examiner, 4 July 1933, p.9. Thanks to Ross Smith for identifying ‘Nina’. The Weekly Courier is not yet indexed on Trove, making it impossible to search on ‘Social notes’ by ‘Nina’. Propriety of the time contributed to this disparity, insisting that she be referred to simply as ‘Miss Farrell’ throughout her life. ‘Social notes’, Daily Telegraph, 25 May 1927, p.2. The full details are K Farrell, Sylvia’s cookery book: tested recipes and items of interest, Launceston, 1914. K Farrell, The charm of the north, Launceston City Council, Launceston, 1922. 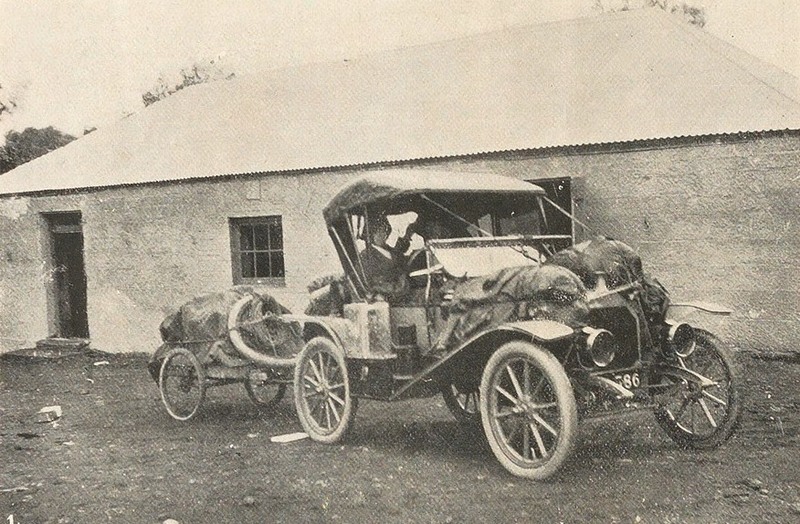 ‘Nina’ (Kate Farrell), ‘Camping at Interlaken’, Weekly Courier, 21 January 1909, p.29; ‘Exhaust’, ‘Motor notes’, Daily Telegraph, 9 November 1911, p.11. ‘Nina’ (Kate Farrell), ‘A trip to Lake St Clair’, Weekly Courier, 11 February 1915, p.28. ‘Nina’ (Kate Farrell), ‘A trip to Lake St Clair’, Weekly Courier, 11 January 1917, p.27. The trip was also written up by ‘Spark’ (Charles George Saul), ‘Motoring’, Examiner, 13 January 1917, p.4. Thanks to Ken Young for identifying ‘Spark’. See Weekly Courier, 11 January 1917, p.17; 18 January 1917, p.18; 25 January 1917, p.17; 1 February 1917, p.17; 15 February 1917, p.17; 22 March 1917, p.20; 5 April, pp.17, 20 and 21; 31 May, p.21; 13 September, p.17; 18 October 1917, p.17; and 1 November 1917 (Christmas issue), p.22. Ray McClinton performed military training 1900–02 in California, film no.981549, MF4:2, National Guard Registers v.61, 1st Infantry, 2nd Brigade, Enlisted Men, 1883–1902, California, Military Registers, 1858–1923. McClinton supported the Allied war effort, but America did not enter World War One until April 1917. See ‘Spark’ (Charles George Saul), ‘Motoring’, Examiner, 3 February 1917, p.4; ‘Plug’, ‘Motor notes’, Daily Telegraph, 13 February 1917, p.6. ‘Journalist honoured’, Examiner, 24 May 1927, p.7, ‘Social notes’, Daily Telegraph, 25 May 1927, p.2. The McClintons’ names were accidentally omitted from the Examiner’s story of this event. See the correction, Examiner, 25 May 1927, p.7. ‘Miss K Farrell’s death’, Examiner, 4 July 1933, p.9. ‘The darkroom at Lake St Clair’, HJ King despairs over the photography facilities, 1917. HJ King photo, courtesy of Maggie Humphrey. The young Herb (HJ) King was a rev-head with an artist’s eye, a man beguiled by cameras and carburettors. The frontage of his father’s motorcycle shop, John King and Sons, which he eventually took over, remains a landmark of the Kingsway, off Brisbane Street, Launceston, long after it closed. In 1921 the rival Sim King’s motorbike shop at the other end of Brisbane Street ran an advert for machines with ‘double-seated’ sidecars: ‘Take her with you!’ That is exactly what Herb King was already doing, the sight of his wife Lucy in the sidecar of his Indian motorbike becoming a signature of his photography in the period 1919–25. It was perhaps King’s conservative Christadelphian faith that determined that he marry young, have children and place the role of family man before all else. He married Lucy Minna Large in Hobart in December 1918. 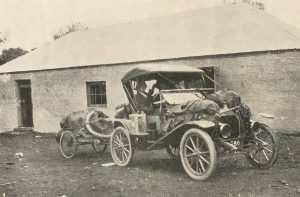 Lucy recalled that King drove her father from Hobart to Launceston. Alighting from the car, Charles Large said ‘Oh, my boy, it’s a long way’, to which King replied, ‘Yes, Charles, what about letting Lucy and I get married at Christmas, instead of waiting?’ She was eighteen years old. He was 26. 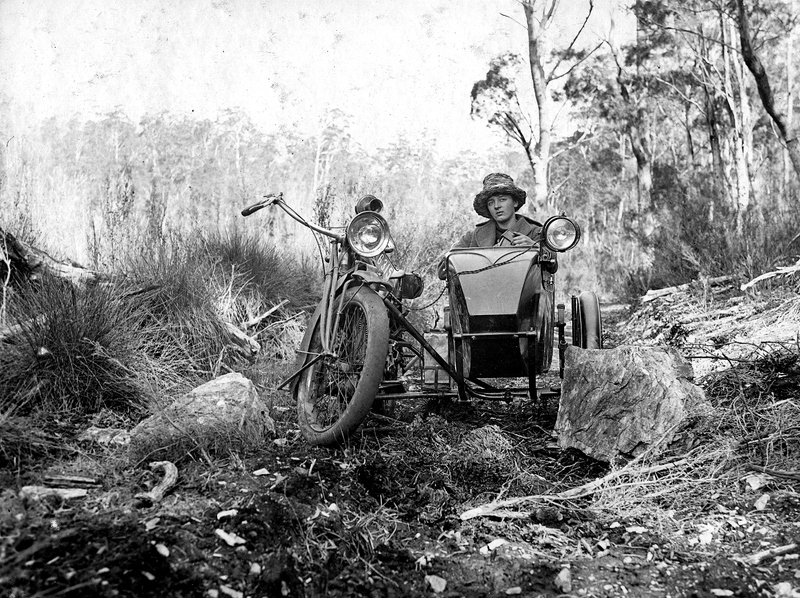 Lucy in the sidecar at Moina, just off the Cradle Mountain Road, 1919. HJ King photo courtesy of Maggie Humphrey. ‘ … as the afternoon was now getting on, we made a laborious descent over the great boulders and across the plateau to Waldheim. How slow the travelling was!—nearly three hours to cover a short three miles—but amidst such scenery we made light of it. We said to ‘Dorfer’ (as he afterwards became known to his friends): ‘Just fancy; if we had a ‘plane we could do the distance in under three minutes …’ Afterwards we talked as we sat inside the great fireplace of the possibilities of preparing an aerodrome in Cradle Valley, and of landing in Lake Dove with a seaplane’. 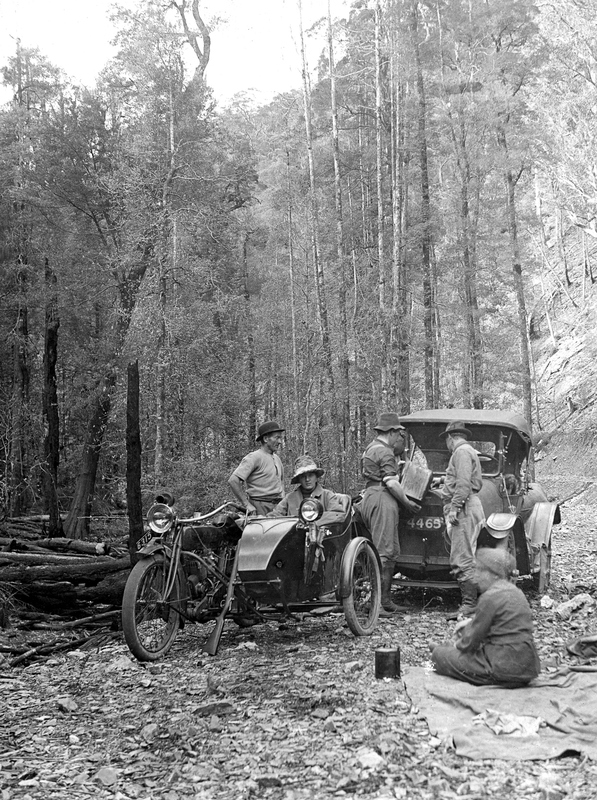 Car trouble for McClinton on the road to the Wolfram mine, Easter 1920, with (left to right) Paddy Hartnett and Fred Smithies helping out; Lucy King ensconced in the Indian sidecar; and either Ida Smithies or Edith McClinton blurred in motion in the foreground. HJ King photo courtesy of Maggie Humphrey. Lucy looking distinctly unimpressed on the road to Pelion at Easter 1920: was it the rough ride or the close attention that dismayed her? HJ King photo courtesy of Maggie Humphrey. ‘eight miles in the pouring rain and when he reached the hut at the top nobody had a dry stitch. 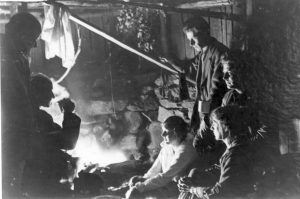 Fortunately for the ladies there were two trappers there, and they obligingly said, ‘You come into the hut where this fire is, and get yourselves dried out, and the men will go to the other hut and make a fire for the same purpose’. The next morning when we woke up it was one of the most beautiful sights that was possible. There wasn’t a blade of grass that wasn’t covered in snow’. Mount Oakleigh and Old Pelion Hut, still with their dusting of snow, Easter 1920. HJ King photo courtesy of Maggie Humphrey. That view included Mount Oakleigh, which Herb King photographed. Members of the party visited Lake Ayr and the head of the Forth River Gorge before starting on the return journey. ‘The huntsman’s story’, taken in the mine workers’ hut at Pelion Plain, with (left to right) Ray McClinton, Paddy Hartnett, Lucy King, HJ King, Ida Smithies and Fred Smithies. HJ King photo courtesy of Maggie Humphrey. Although Paddy Hartnett never used the media, he was equally significant as Weindorfer in the development of a Cradle Mountain‒Lake St Clair National Park. 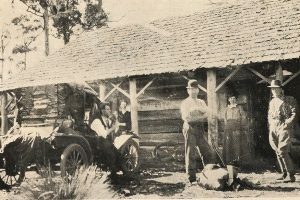 Hartnett’s Du Cane Hut, also known as Cathedral Farm and Windsor Castle, was effectively his Waldheim, a tourist chalet among the mountains. King’s treks to Cradle Mountain and Pelion with their respective guides were transformational in the sense that, although he never became a hardened bushwalker like his fellow photographers Spurling, Smithies and McClinton, he did become a promoter of the Cradle Mountain-Lake St Clair National Park proposal. McClinton photos from this trip appeared in the Weekly Courier, and he, Smithies and King lantern lectured about the proposal. A slide survives of King promoting himself as a nature photographer, suggesting that he toyed with the idea of turning professional. Presumably, he decided it would not pay. The Kings were a very conservative family. His grandmother, said to be the first Christadelphian in Tasmania, was reputedly disgusted by King’s spending on photographic materials. Perhaps family influenced his choice of career. It is possible that the family motorcycle business seemed a safer bet, or that he felt obliged to follow in his father’s footsteps. Ultimately, people, family and faith meant more to King than any machine or any gadget. It was probably not just for artistic purposes—the compositional need for a foreground—that he placed Lucy in so many of his images. It signalled that she was foremost in his thinking. See, for example, Sim King advert, Examiner, 2 July 1921, p.14. Lucy King, transcript of an interview by Ross Case, 18 March 1993, OH18 (Queen Victoria Museum and Art Gallery [hereafter QVMAG]). Lucy King, transcript of an interview by Ross Case, 18 March 1993, OH18 (QVMAG). HJ King, ‘A flight to the Cradle Mountain’, Weekly Courier Christmas Annual, 3 November 1932, p.12. ‘Motors, cycles and push bikes’, Daily Telegraph, 17 April 1920, p.5. See Weekly Courier, 15 July 1920, p.24. 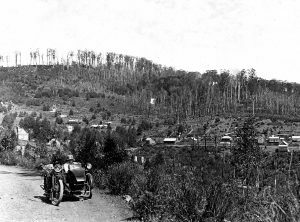 McClinton’s photos of the Easter 1920 trip with the Kings, Smithies and Hartnett was used here to illustrate part one of George Perrin’s account of a January 1920 trip into the same country with his wife, Florence Perrin, their friend Charlie MacFarlane and Hartnett (‘Trip to Tasmania’s highest tableland’, Weekly Courier, 8 July 1920, p.37).